The Navy Memorial and Naval Heritage Center in Washington DC honors and commemorates the sailors of the United States Navy. The memorial is an outdoor public plaza and the Heritage Center serves as a place to learn about the history and heritage of the men and women of the sea services. 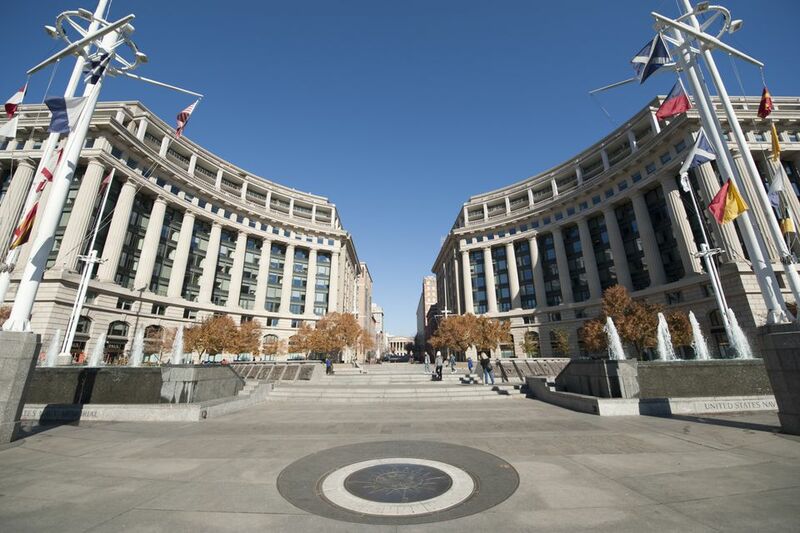 The circular outdoor plaza, located in the heart of Washington, DC, features a “Granite Sea” map of the world, surrounded by fountains, pools, flagpole masts, and sculpted panels depicting historic achievements of the United States Navy. A statue of the Lone Sailor represents all people who ever served in the sea services. Adjacent to the memorial, the Naval Heritage Center houses interactive naval exhibits and a movie theater with daily screenings of the award-winning film At Sea and the Discovery Channel’s A Day In the Life of the Blue Angels. The Commemorative Plaque Wall is a permanent memorial dedicated to individuals, groups, ships, squadrons, commands, battles or events within the U.S. Sea Services. Also onsite is a Media Resource Center, which provides a library of historical documents on the Navy. The Navy Log room provides a computerized registry to search for Sea Service members and veterans. The Ship’s Store sells nautical souvenirs and clothing. Each April, following the National Cherry Blossom Festival Parade, the Navy Memorial pays a tribute to our nation's rich naval heritage and the men and women who have contributed to its growth and success with its annual Blessing of the Fleets. During the ceremony, sailors from the U.S. Navy's Ceremonial Guard proceed across the outdoor plaza's "Granite Sea" to pour water from the Seven Seas and Great Lakes into the surrounding fountains, "charging" them to life and welcoming the spring season. The event is free and open to the public. The Naval Heritage Center is available to rent for special events. The Gallery Deck, or main space, features a full view of the exhibition area and can accommodate up to 115 for a seated dinner and 225 guests for a reception style event. The President Room is ideal for meetings or dinners and can accommodate up to 50 seated guests, or 75 standing. The Gallery Deck and Presidents room can be combined to accommodate as many as 420 guests for a reception. The state-of-the-art Burke Theater comfortably seats 242 guests and features a 46' X 16'screen, high definition projector, 7.1 digital surround sound, integrated teleconferencing and audio/video recording.